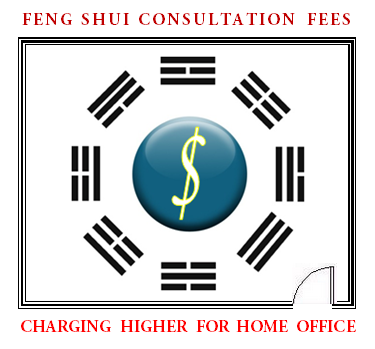 Feng Shui home office consultation fees charging higher – why? As once more just the other week, a Feng Shui client remarked about our not charging higher consultation fees for her home office, I thought to devote a blog post on the subject. It’s where Feng Shui clients are being charged a regular fee for their private home, then a higher fee to concern of the m2 or ft2 of floor space for their home office, if they happen to own a business. One of considerations I give out to students in our study program is, whenever you’re out on a Feng Shui audit for a private residence, just waive to be charging any differently for a home office. As a professional Feng Shui consultant, it only makes sense to distinguish between how you’d charge for just a private residence or a corporate building. It’s not that. Comparatively, if you own a business and I am being invited to doing a Feng Shui audit for your corporate building, your company would be charged accordingly and fees would reach beyond what would have been charged had I been invited to doing a Feng Shui survey for your or anyone’s private home. If then – for lack of a better illustration – you kept a room in your company building, but it was for personal use – say, your spouse and kids visit you there each day -, that’s immaterial and such room wouldn’t be charging any differently. Yet, it would seem how a good many Feng Shui consultants would charge higher for your home office, if you invited them for a Feng Shui audit for your home. The way I can only presume they’d do that is, they would somehow figure they should be charging corporate fees once stepping onto those m2 or ft2 of home office. It’s beyond me why that is. I have done hundreds of Feng Shui audits for private homes since 1996, a great many of which would host a home office. Not a home office where one would sit to paint, twiddle one’s thumbs or play with a Nintendo DS, but a genuine home office belonging to a business and there to actually acquire revenues. On the other hand – someone might wonder – what if came out the home office in a private residence didn’t belong to a business that was actually somewhere else, but the home office actually constitutes the business itself, in that, the company’s owner not only lives in the house, but spends the entire day running the company from out of the house. Well, what about it, I’d say, as I guess one would be still charging fees for private homes. Think about it. If you are on to auditing a home, every interior space in the building comes as just an integral part of that floor space. You would not charge less if so came out, the people of the house told you they hadn’t been using 3 rooms, or if one of those rooms in the house was actually losing them money for whatever reason. It’s of no concern. One single Flying Star chart applies to all of the floor space. An eventual home office would no more than be situated some place in the floor plan and it would be taking in whatever portion of 45 degrees directional sector, then hosting a Mountain Dragon, a Time Star and a Water Dragon (M-T-W). To that respect, the Facing Palace, the Sitting Palace, the hallway, the kitchen, the bedroom, the family room or the home office, it would all just neatly fit into the same 9 Stars and Luoshu set-up. Irrespective of then function of a room, M-T-W for any individual unit in the house would only logically fit into the Flying Star chart as a whole and it would naturally include in your survey to account of Qi confinement, Qi transportation, Qi distribution, as also it would be a player in the whole scheme of doors and windows being opened of closed, to either allow or disallow pathway for Qi. If you’d then prefer to see an elevation somewhere to the back of such home office, it would be there for reason of sustaining the Flying Star chart of the house, which would be no different for H2O outside the premise. Whatever it was you then deemed fit for the ‘home office’ Feng Shui-wise, you would approach in pretty much same way as if the room had been there to serve any other purpose, so, as it is, you would position desk and chair according to the time-tested Armchair Setting, and this would eventually come out no differently than if it were just a rocking chair and coffee table for leisure in the room, yes? Or I may be overlooking some aspect here, but there would seem no immediate reason to be charging a higher fee for just a home office. To begin with, never in my time as a Feng Shui consultant, would there have been any reason to tick into some sort of momentary ‘charge for corporations’ table, if only because, even with the CEO of the company there as a resident of the house, never would the focus of attention have gone to the company as such, business strategy as such, but just looking at how to adjust such office space as it came as an integral part of the built structure and how it would best fit in with the rest of the Flying Star chart. Then also, not once in my experience, would such ‘CEO’ have taken the liberty of taking advantage of the situation so that, yes, affairs would have clearly changed-over to becoming a corporate audit. If taking a Feng Shui tour through your house, I may enter a room and tell you “well, nice”. If then you told me “it’s my home office, and it earns massively for my business”, this would actually trigger nothing at all in my brain, certainly not if it meant that it would have me go something to the effect of “ah, this bit of floor space in the house would be generating $ for the people”, because the function of the space within then context of that particular Fei Xing audit for a house and how it would otherwise fit in with Fei Xing prescriptions, would be as such immaterial. There are no set rules of course, so fortunately, everyone in the field of Feng Shui would be formulating standards according to own insights, certainly free to work from considerations that may otherwise escape my attention, but to that respect, just as I’d enter your kitchen and this would do nothing on ‘a’ Richter Scale in terms of fees charged, it’s no different for your hallway or your home office. Next post: Why would Feng Shui be termed Feng Shui?